Handy brandable sachet. 7.5ml SPF50+ Sunscreen. High SPF50+ Everyday Sunscreen. 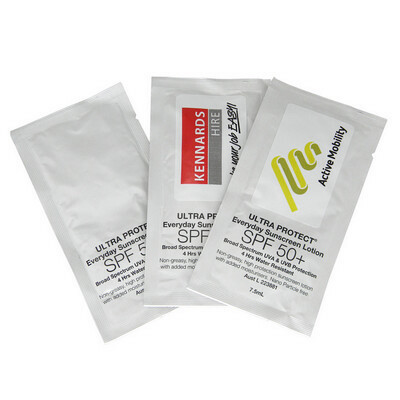 Broad Specturm Protection from both UVA & UVB. Specially designed non-greasy formula with moisturiser. Easy application and absorption. 3 year shelf life. Australian made for Australian conditions. TGA Approved. Product Size: 40 x 100mm. Product Packing: Bulk Packed. Decoration Size: 15 x 35mm. Decoration Position: Front of Sunscreen Sachet. Decoration Method: Pad Print. Carton Quantities: 1000. Carton Size: 30 x 22.5 x 31.5. Carton Weight: 8. Colour: White. Price includes : Pad Print 1 Colour / 1 Position. Setup is included.